Thank you for staying tuned to my blog alright? I love you all. I'm going to talk about Lifestyle @Cineleisure today! To me, lifestyle is about how you spend your free time! Or say how to enjoy life! & here is how I spent my day there as an PERFECT example! Yay! 1st thing about having fun is? To be pretty isn't it?! & Having nice hairstyle and hair colour is SO important! So there is... SUPER CUTS! so..... hahahahha! No pretty poses from her! She could only do funny faces to "cancel off" how unglam she look at that moment! You can still stroll off to Cineleisure then sit down at Super Cuts to fix your hair while waiting for your friends to arrive! Don't have to worry abour messy hair/ showing-roots/ whatever relevant! So next next next ! I don't know if it's just me, but Bubble tea do fill up my tummy! From none other than, ARTEASE! So I really really love their creativity & I support local stuffs a lot! HOW CAN YOU HAVE A LIFESTYLE WITHOUT A VARIETY OF DRINKS?! You can bring your drink around Cineleisure to PLAY! lets go to Candies! Yay! Who's not MAD-IN-LOVE with Candies? where ever you want to go and pop it in your mouth when you feel like it! 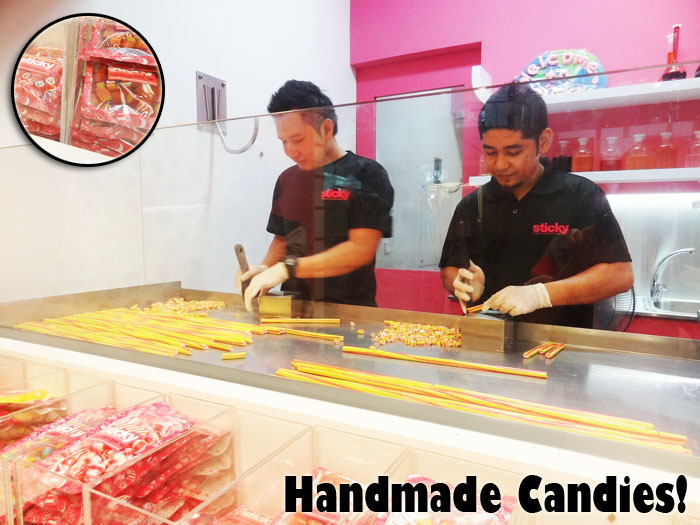 into your candy and it's 100% hand-made! 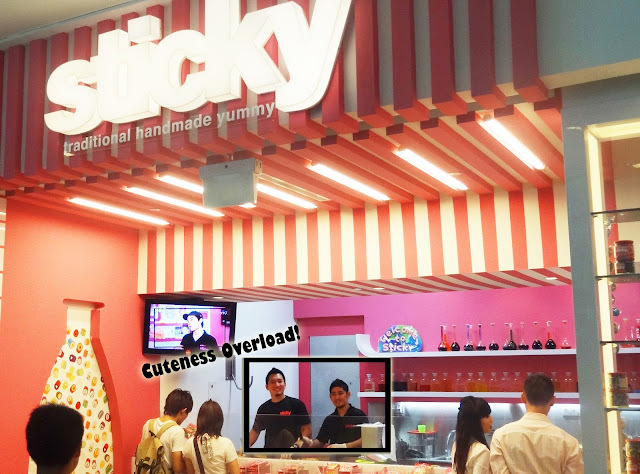 &&&&& while you're thinking of what to buy..
YOU CAN LOOK AT THESE REALLY CUTE STAFFS MAKING CANDIES! I super love how helpful and kind they are! You can ask them anything about Sticky and they can answer you! So there's more variety of sweets you can choose from! They even have chocolates there~ Awesome! SO MANY VARIETIES FOR ON-THE-GO SNACKS AT CINELEISURE! that E-max is the best place for your family and friends to gather! & gather with your family to play "controller games"! & no worries if you have kids (like me!) there too! Ehhhemm~ Okay, a lousy card! But nvm! As long as I had fun~ ! You can all gather there to have fun! Yay! Another awesome place for crazy boyish girls like me and BOYS~! I loaded my card with SGD5 and started playing LOTS OF GAMES! I played the Maximum Mid-night Tune! Yay! My fav. game in the arcade and I know many of you have heard of it right?! and 3/4 of my make-up already fell off! I know now many many many of you are SUPER TEMPTED to play at the Arcade/LAN right?! & Yes, other than snacks, you will need actual meals too! I had to had my dinner so we decided to go to the Graffiti Cafe which sells Pon Tian wanton noodles! who don't have much allowance to dine in Japanese cafes and everything! EAT WHAT YOU WANT AND THAT YOU CAN AFFORD! Plus plus plus, choose something that you WONT regret! Or you will not have a whole day of fun but hours of guilt after your meal! This is Venice's AhBoling~ *an interesting dessert! HOW CAN WE NOT DRAW SOMETHING! & there we go slack slack slack in the "cafe" ! Have a WALK with your friends/family! with you all isn't it! WHAT IS LIFESTYLE WITHOUT MOVIES?! The MOST important ever and ever is watching movies with your family and friends! our whole day there without stressing where to go and what to do next! Whenever you don't know what you can do you can always check out the latest movies in town! 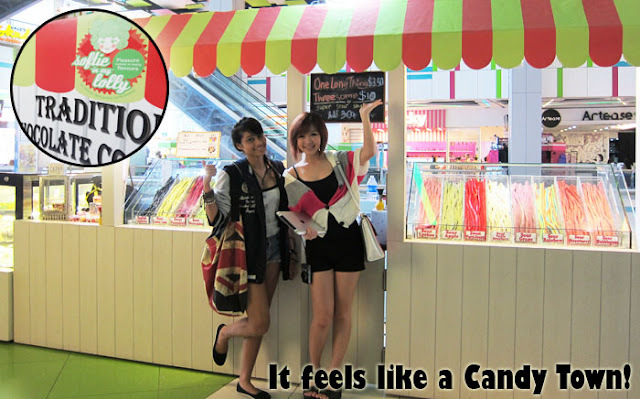 So where's there not to go to CATHAY CINELEISURE ORCHARD! Best place for you, me, us, families and friends! 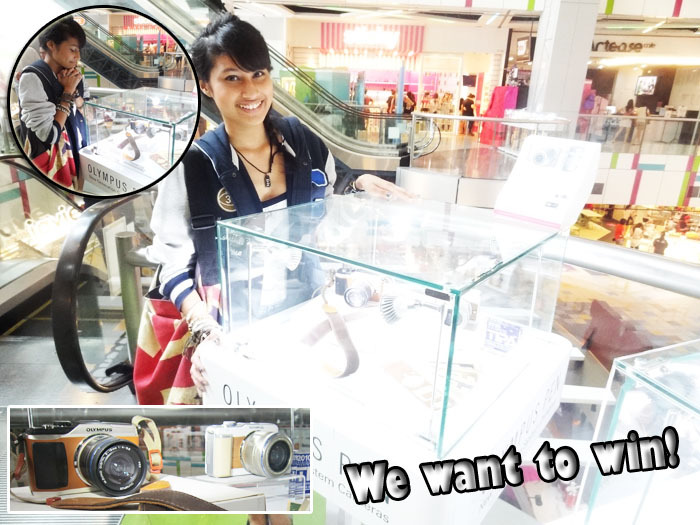 Please check out my summary video of what the Uptown girls have done at Cineleisure! & Look at how much fun we had! Head down to Cineleisure this weekend/weekday to play like us too! so they rather go to neighbourhood area to shop! Not that it's not good but town is STILL town! So do have fun without worries! We, the uptown girls, headed to The Cathay to catch "The Hunger Games"
So do check it out since it's so hot in the cinemas now! with your friends who've watched it! *I bet they all must've watched it already cause the seats are always fully booked in the cinemas! Make-up almost 100% faded after the whole day! Me and my family also go to arcade yesterday.. it was really fun having a family bonding time.. and I think one of the best moments I have is when I'm with my Best Friends.